One of my favorite stories to watch for Christmas is the story by Dr. Suess, “How the Grinch Stole Christmas.” Right now, there are only two major versions of this story, but I think both are quite special in their own ways. The original “How the Grinch Stole Christmas” cartoon may be “old” but I think I could say the words along with the narrator by heart! This “old” version focuses on how The Grinch despises Christmas and plots to steal Christmas away. It’s not a very long cartoon, but it follows The Grinch as he creates a Santa Claus costume, puts an antler on Max, and sneaks down into Who-Ville at night to steal the presents and trees of everyone. You get a brief glimpse of little Cindy Lou Who, but The Grinch quickly tricks her with a story about a blown light bulb.The feast at the end of the special is so heartwarming and deserves a special place in my heart. However, I have found myself watching the “new” version of “Dr. Suess’ How the Grinch Stole Christmas” much more often in recent years, and I think it is because this version took a unique spin on the original and expands on it in some delightful ways. 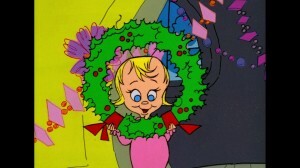 I love how the movie focuses on the materialistic nature of Christmas – how Betty Lou Who competes against Martha May Whovier in decoratring her house for Christmas, how everying spends all their money buying presents and goodies for Christmas, and how little Cindy Lou Who feels lost and unsure about what Christmas should really mean. Cindy’s suggestion to make The Grinch the special guest of the “Wholibration.” The Grinch is actually flattered – he may be a “bad guy” but he’s not really bad at heart… I also like that they show The Grinch’s childhood and how he wanted so badly to fit in with the other Whos but just couldn’t because of his appearance. Whether you are a fan of the old or the new Grinch Christmas specials, I think both make a great special to watch around a nice cozy fire on a chilly winter night!